So my version of this topic is my best friends in the book blogging community! And a quirk that many of you probably don’t know about me is that I have a fear of commitment-big ones and small. I don’t follow a lot of blogs compared to most (~50) because I like to keep up with the content of those I do as frequently as I can. But I follow all the people on this list so that is saying a lot, in my opinion. I can promise that each of the bloggers I’ll mention are my favorites for their content, honesty, and creativity. And the order is not by favoritism. It was hard enough to choose bloggers for this feature let alone order them as my “favorites.” That’s like ordering your kids by how much you like them instead of age-no can do, I can’t do that! So alphabetical it is! I think I knew I was going to like her when she mentioned she’s a bubble tea drinker and Vietnamese-American. (Honestly, it’s the bubble tea thing. I mean people that like bubble tea can never bad. Okay, so maybe that isn’t the most sound reasoning… But I love the people that can share my love for the drink!) She’s actually a little older than I am but I feel like we go through a lot of the same things. And though she’s the greater critic of us two, I really enjoy buddy reading with her! I buddy read A Darker Shade of Magic (my review) and, now, White Cat, which we both (or maybe just me) seem to be lagging behind on. We’ve only known each other a short time (3 months, I think?) compared to the other folk I’ve listed on here but we just get along so well. I discovered her when I stumbled on her utterly gorgeous Bookstagram and then learned she had a WP blog. We didn’t really start talking until recently when we found out we were anime sisters (aka our anime taste is THE EXACT SAME). I still can’t believe it took me this long to find someone like her to fangirl over Usui Takumi and lament when my OTP ships aren’t cannon. And she probably didn’t realize it but she’s sort of the inspiration behind why I decided to use my Instagram for this blog more seriously and frequently. And because of it I was opened to an entirely new realm of book lovers. I love it! She goes by CW in the blogosphere but I actually call her by Chooi usually. I’m sure others that refer to her as so but just let me think I’m special, okay? Anyway, I stumbled on her blog because she wrote such amazing, thoughtful reviews-and a lot of them. I know that she’s been gaining more popularity, but when I first saw Read, Think, Ponder I couldn’t help but thing how underrated it was. Plus, she’s been blogging for longer than I have (hence the myriad of book reviews on her blog). Her artwork (the banners) are created by her and are simply beautiful. I also love that although she’s a little older than I am, we shared the same insecurities about our academics in terms of graduate/professional school (Chooi with psychology and me and pharmacy). Anyway, she’s such an amazing and sweet individual. I love that she writes such formal reviews but uses a galore of cute emojies in conversation. The first thing that caught my eye when I stumbled upon her blog was that she was a researcher and I was just thinking, How cool! I need to be friends with her. However after meeting her, it wasn’t later until we became closer and lamented on our spending habits and talked about random things surrounding books. And only Jenna can understand my love for Jem. I think all of conversations go back to our favorite books such as Clockwork Princess and A Little Life. And thanks to her I was able to meet the super sweet Jeann at Happy Indulgence, who I’ve been getting to know for a few months now, because Jenna co-blogs with her. I’ve talked to Aila, their other co-blogger, via our Instragrams, too. I think I can always count on Joey to tag me in whatever tag he completes on Saturdays (but that could be because I gave him so much grief after this one time where he didn’t-LOL). He makes a lot of good points about myself that I don’t really notice, like how I don’t ever take real blogging hiatuses like I promise I will. (Today’s post is proof of that.) And we both seem to love otters and a cappella (though I believe he’s a greater enthusiast for the latter than I am). And coincidentally we have a real life liaison (a mutual friend), Savindi, who used to blog on The Streetlight Reader. Joey knows her in real life but I met her early on in my blogging journey through our blogs. Oh, Marie. She’s the wanderer that fulfills the wanderlust in my soul. Okay, that may have came out too deep. But I simply love her lengthy travel posts. The pictures are perfect and you can really see how they reflect her as a traveler and individual, which is pretty awesome since she’s one of the more shy bloggers within the blogosphere. We started blogging around the same time (though I believe she a bit longer than me) and I really love that we can understand our “blogging era” along with Trisha at The Bookgasm and Erika at Erika in Bookventureland. The first thing I noticed about Thuong was that she was Vietnamese. And then I saw her beautiful illustrations. (Like, seriously, if I ever go self hosted and want a real blog banner I’m going to seek her and request a submission-she doesn’t know this yet, lol; but really her art is just that beautiful). Thuong reads a lot of diverse books from different genres but our taste seems to overlap when it comes to YA. We’re always talking about Stephen King and other authors we haven’t read but plan to read. (Well actually she just remedied that and I still haven’t read his work…) She’s my TBR buddy in that we seem to talk about each of ours a lot. And she has such great taste in blouses-I know, how did you even learn this, Summer? Because she always features it on her Bookstagram; I swear I’m not a creeper, lol! I think of all the bloggers Trisha understands my bond and relationship with my dad the most. I’m very close with him because of my parents early separation and the family business that we have. She knows things that I haven’t told most people but she’s such a great, supportive listener. Somehow she always knows what the right thing I need to hear is and says it. We started blogging around the same time, too. And I love that outside of our reading and blogging we’ve shared more personal things to each other. Even though I chose ten individuals this time to spotlight. I’ve met a lot of amazing people along my blogging journey. If you want to meet more of the friends I’ve met or follow some new blogs, do check out my tag/award posts where I tag/nominate a lot of awesome blogs and my most recent Summer Says discussion on the type of book bloggers. Thanks for these blogs – I will definitely check these out. So many wonderful bloggers. I must say, I agree with Joey about the blogging hiatus haha. Now bubble tea. I’ve heard so many amazing things about this and even though I am a HUGE tea drinker I’ve never tried one. I feel like I need to rectify this situation. Agreed! Reviews influence whether I pick up a book or not, and the individuals in the book blogging community are great resources for that. I’m 3/3 from your giveaway “how well do you know Summer” quiz and I welcome ANY more questions because I know all. I made the mistake of following hundreds (thousands?) of blogs because I was pretty adamant on making connections when I started — then the process of culling more than half was the most tedious thing ever. Do not recommend. And let’s be honest, Summer. We all have favourites [blogger BFFs]. Just admit it and move on. Haha, you did! (The funny thing is so many people missed my favorite color (when my entire blog is pretty much blue??) but no one forgot Jem.) And, oh my gosh, your WP reader/feed probably blows up. How can you even blog hop properly? I can’t do that. AND NO FAVORITES. Great list! I’ll have to check out some of their blogs! AW SUMMER. tackles you I want more than anything to give you the biggest of hugs in the history of big hugs?! Honestly, thank you for your sweet, sweet words. ;_; You are such a wonderful and lovely person and you’re like SUNSHINE in the blogosphere! And yaas gurl, thank you for sharing those insecurities and your thoughts with me. It means a lot and it really helped having someone understand during those BLARGH times. Next year I shall follow in your footsteps and return to university to do my postgrad! YAAAY. cuddles back And I appreciate you. ❤ Hope you’re enjoying your break from the blogosphere, Chooi! Great picks this week. This weeks topic has to be one of my all time favourites, I have managed to find some brilliant bookish people to follow. Thank you for your great recommendations, quite a few of these are new to me and I am excited to check them out 🙂 You can see my picks here. 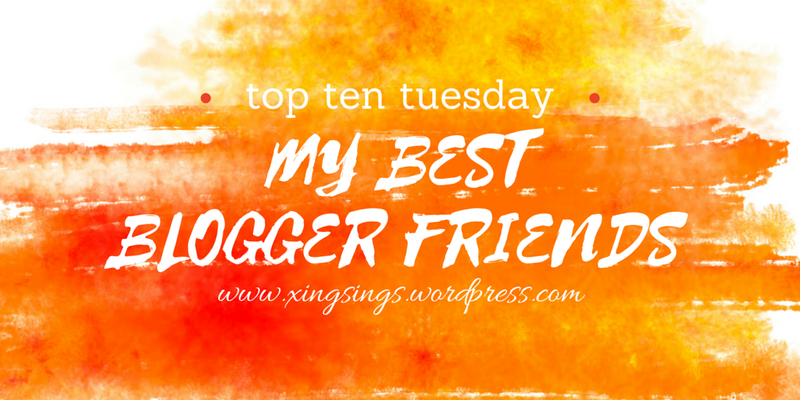 Oh wow usually I just kinda… let these sit for such a long time but I’m so touched that I made it onto your list of Blogger BBF’s (you would be on my list, as well)! I also feel like I should let you know that even if I don’t comment, I do read your posts since they show up in my inbox. Let me just say right now that I am super proud that my fangirling made you read ADSOM faster xD like I wasn’t even trying to push a book onto you and I still succeeded and I just find that really hilarious. And can I just say that your love for the blogging community is so inspiring. You were my first commenter and I went to visit your blog and was like “WHOAAAA this is so pretty! Must follow.” I’ve found so many new favourite books after reading your reviews (eg. Wolf by Wolf, The Weight of Feathers) and I’m so happy that we can share the love for all these amazing books! So only now with this comment did I notice that Jem/Will and Jude/Willem are both J/W pairings. What a coincidence! You’re so welcome! I’m so happy I was able to find you in the blogosphere, Thuong. 🙂 And oh gosh, really? T.T Well thank you in advanced! You already know I’m a big fan of your illustrations so I’d really love that if that day does come. 🙂 Hehe, you’re welcome. I’m still ultra envious of your Tommy Hilfiger blouse; that one is my favorite! Me too! Thanks for finding me 😀 Yeah, I don’t mind creating a banner for you if you go self-hosted, that would be cool 🙂 Your welcome! Aww is it? You can borrow the Hilfiger blouse if you want 😉 I brought it in the sale, as I couldn’t justify paying £85 on a shirt! Thats like 2 weeks of groceries lol. I am not as active as before in checking out blogs lately but I agree with you on what you’ve written here about other bloggers especially CW’s. Her reviews definitely make you think twice about what you wrote. Haha! And Marie’s travels are just enviably amazing. PS Sorry! My comment is already 2 weeks late! OH NO. DON’T CRY, TRISHA! T.T But your sincerity, thank you! I feel the same way! Thank you for being there and listening to those times. I’ll remember that, thank you! T.T tackle hugs back And just so you know it goes both ways; if you ever feel like you’d need to confide in someone that isn’t physically in your real life, I’m here for you as well! Aww, thank you! Lately, I haven’t even been checking my reader of WordPress so I can relate. Even though I’m back from my weird/confusing break, it feels strange to return to the blogosphere. I feel out of it if that makes sense. I’m still really sluggish with creating posts and replying to comments. (And I still haven’t found the words to make reviews (i.e. Me Before You).) Maybe I’m still stuck in a small blogging slump. Thank you so much, Jeann! And that was long but very heartfelt sentence. ❤ I feel the same way. I say it often but I never thought blogging and joining the blogosphere would allow me to meet so many amazing individuals I wouldn’t have met otherwise. I’m really grateful! Future sprinkles visits are welcome. P.S. Be sure to connect with me on Instagram; I’ve been more active on there lately.